To say that the age divide in Japan is wide would be like saying Battle Royale is a violent movie, with both statements deserving a rich, hearty, â€œWell, duh.â€ Although the divide between young and old people isnâ€™t unique to Japanese culture, they certainly seem to have a societal preoccupation with the growing gap between the perceived self-destructiveness of youth and the unrelenting rigidity of the older generations. This was Battle Royaleâ€™s take: the differences between generations are so irreconcilable, they can only be maintainedâ€”with bloodshed. 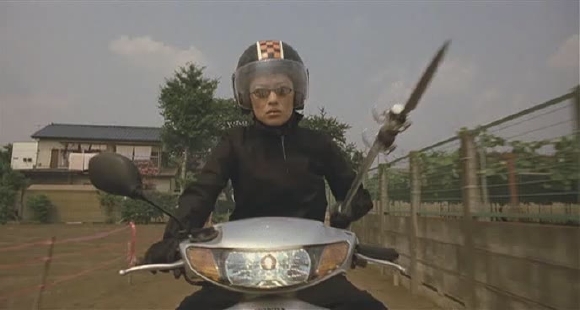 And it seems to be the take of Tetsuo Shinoharaâ€™s Karaoke Terror: The Complete Japanese Showa Songbook, a whimsical, gruesome, and effective dark comedy whose campy title belies the grim interpretation of its subject matter. And yet, Shinohara seems to suggest a different take on the matter: are our differences really that pronounced? Or are we all mired in a sort of aimless, self-indulgent existence where we willingly submit to the mindlessness of violence, revenge, and karaoke? 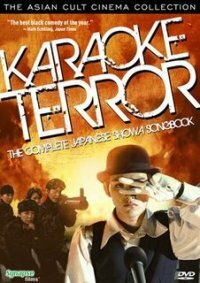 Karaoke Terror is a story of murder, revenge, and escalation, with karaoke sprinkled in for good measure, and ominous song lyrics titling each of the filmâ€™s chapter breaks. 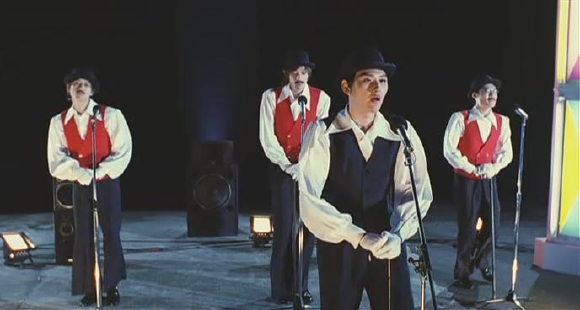 A group of five young men spend their nights goofing off, ogling the showering woman next door, singing karaoke, and generally wandering through their lives without aim, ambition, or reason. Even their friendship seems pointlessâ€”by their own admission, they have nothing in common. Itâ€™s no surprise, then, that the event that triggers the filmâ€™s plot is itself a random event, a â€œglitch,â€ as the perpetrator calls it. One of the five men, Sugioka, sees a middle-aged woman on his way home, gets aroused, follows her, and tries to pick her up. Convinced that, at her age, she should be grateful sheâ€™s even getting the attention, Sugioka is shocked when she rejects his advances and calls him a pervert. So shocked, he slits her throat without saying another word. At first, heâ€™s completely indifferent to the murder. But when it appears in the newspaper the next day, heâ€™s quick to tell his friends that, yes, that was him, and yes, hereâ€™s the bloodied blade to prove it. Unsurprisingly, his friendsâ€™ reactions are amused disbelief, each one taking turns holding the murder weapon. On the other side of things, the victimâ€™s friends are in mourning. They are five middle-aged women who actually have something in common: theyâ€™re all named Midori, theyâ€™re all divorced (an apparently bad stigma for women in Japan), they all love karaoke, and they all want to avenge the death of their friend. (In a way, they have toâ€”the police in this movie prove comically inept. To them, each murder case in unsolvable, each killer uncatchable.) 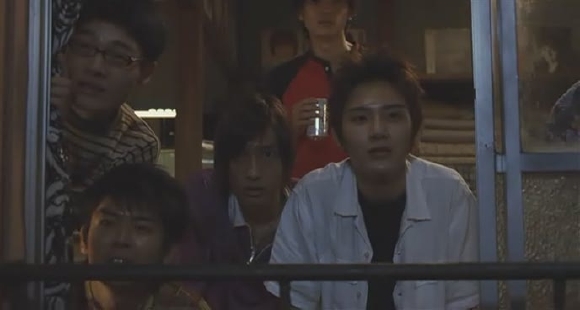 And so, tracking down Sugioka through a bit of improvisational police work, they plot their revenge. Ironically, itâ€™s their plotting that brings them together and gives their own aimless, shattered lives meaning. As they sit around talking about their plot, they realize itâ€™s the first time theyâ€™re actually talking and listening to one another. And that the plot is allowing them to â€œconcentrate,â€ something theyâ€™ve not been able or willing to do as their 30s rolled on. Free will, or the lack thereof, seems to be at the heart of this story. The unquestioning aimlessness of both the young men and the Midoris seems to speak to the absurdity of a generational conflict thatâ€™s fueled less by actual interaction and more by hearsay. The verbal exchanges between the men and the Midoris are scant and based on pure assumption; Sugiokaâ€™s crude wooing of the first Midori is as much, or as meaningful, as anything these two factions will say to one another. Yet they believe without question what others say about their opponents. It doesnâ€™t matter if itâ€™s a senile hardware shop owner who says middle-aged womenâ€”not roachesâ€”will survive nuclear holocaust, a creepy female student who witnesses the first murder and goes on to cooperate with both sides, or a retired, angst-ridden soldier who just wants to sing the Midoris karaoke before he shows them how to use the M-72. Both men and women surrender to hearsay, driven by assumption, obeying without question the words or instructions given to them (especially at the end), disregarding the grave consequences of their actions. By the end of the film, the surrender of free will becomes catastrophic, not just for the men and the Midoris, but for countless others. 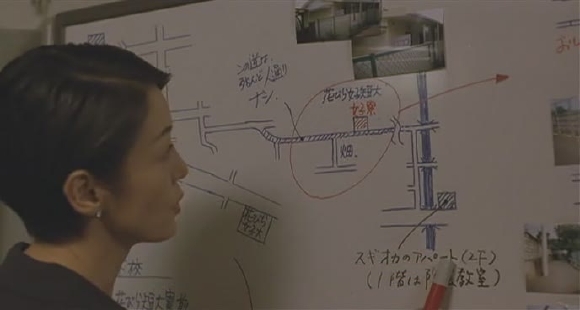 Shinoharaâ€™s interpretation of the age divide and gender divide in modern-day Japan is bogged down by a plot that drags, especially between the second and third sets of murders. During this time, he tries to flesh out his critique, giving us glimpses into the frivolous, amnesiac lifestyles shared by the warring factions, possibly arguing that revenge itself is an isolated, aimless gesture whose purpose is quickly forgotten. But the film suffers a bit from it, because the good pacing and stylistic approach of the opening revenge salvos slows to a crawl. By the time the Midoris are back in action, youâ€™re kind of glad someoneâ€™s blowing something up again. didn't think much of this at all. 'party 7' is a little better, but only in slight patches. I was hooked with the first throat slashing.. it was however painfully slow in the 2nd half at points, but the ending was unbelievable!